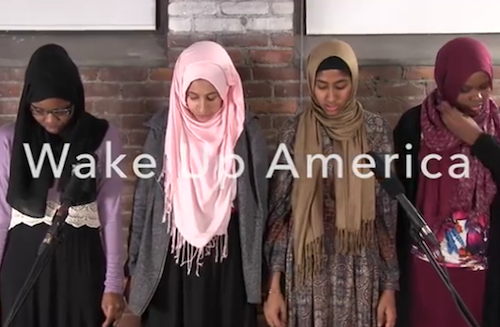 This is an image that depicts the youth of the quadrant slam poetry group, Muslim Girls Making Change formed in Burlington, Vermont. Although these young women are only in their teens, they are making great strides to promote awareness of Islamophobia as well as sharing the truth of the peace in Islam through their lyrical rhythms. In modern America, Muslim youth are making a huge impact in the world today.They are changing societal perceptions of Islam, giving light to Islam’s connection to modernity, and promoting peace within Islam. It is important to explore how modern Muslim-American youth are defining what it means to be a Muslim in today’s generation, because it gives a perspective of the religion of Islam through the lenses of Muslim youth. The majority of these youth are facing dual identity struggles as they are expected to stay conservative in this ever-changing American society. It is common for most Muslim youth to experience role confusion because many of their parents expect them to stick to their traditional Muslim beliefs and practices. It is important to note that they are going through the same adolescent changes as any other youth would go through in America. In the book, Young Muslim America, Muna Ali expresesses:“Unlike their parents, these offspring of immigrants or converts now in the second, third, and fourth generations were born into both Islam and American culture. They have experienced America’s educational system and weekend Islamic schools, minority status, and American popular culture (Ali 44).” In her quote, Muna Ali captures the transitions that modern youth Muslim are going through in regards to generational changes in school and popular culture. From my own personal experience, I can testify to the dual-cultural identity that Muslim youth possess. My dual-identity is embodied through the contrast of my experiences as a UVM student and my experiences as a student studying Islam at weekend schools. In my classes at UVM, I examine and study contemporary world issues, scientific innovations, and modern literature; while in my weekend Islamic school, I focus my study on interpretations and recitations of the Quran. This contrast has a direct impact on my parents views on my academic schooling, as they worry that my secular education may disconnect me from my personal beliefs and religion. . Typically, Muslim youth are expected to follow Islamic practices while at home, such as praying and using Islamic invocations. One example of this interaction in the household is outlined in Keeping it Halal by John O’Brien. O’Brien illustrates the ethnographic approach to understanding the lives of Muslim teenagers in America. One of the experiences the author described was being invited to a male teenager’s Islamic household and witnessing the practice of saying “Bismillah” (In the name of Allah) before and after the family eats (O’Brien 9). As a Muslim, I thought this experience was interesting because the invocation is emphasized mainly at home but rarely outside the household; however, youth have the power to choose when to use it depending on how strongly they link to the religion. It was interesting to witness the cultural changes that occur outside the homes of Muslim boys who were the focus of the O’Brien’s text. The characters were still involved in dating and keeping up with hip-hop culture that is frowned upon to their parents. This is a great example of how the youth are changing societal perceptions of Islam because they are engaging in activities outside of the religion’s norms. As a result, they are incorporating new, contemporary ideas into their definition of a modern Muslim. Modern Muslim youth are the future of Islam. It is important to understand their experiences, new ideas, and beliefs of the religion. They are spreading peace and changing the Islamophobia epidemic. Ali, Muna. Young Muslim America: Faith, Community, and Belonging. New York, NY: Oxford University Press, 2018. Aydin, Cemil. The Idea of the Muslim World: A Global Intellectual History. Cambridge, MA: Harvard University Press, 2017. O’Brien, John. Keeping it Halal: The Everyday Lives of Muslim American Teenage Boys. Princeton, NJ: Princeton University Press, 2017. “Mapping Islamophobia.” Visualizing Islamophobia and Its Effects. Accessed March 09, 2018. http://mappingislamophobia.org/maps/. Salili, Farideh, and R. Hoosain. Growing Up Between Two Cultures: Problems and Issues of Muslim Children. Charlotte, NC: Information Age Publishing, 2014. This entry was posted in Student Post and tagged America, Cultural Identity, Muslim Youth. Bookmark the permalink.